What are the elements of a truly good horror story? Well, in this writer’s humble opinion, what separates a great horror novel from a cheesy ripoff is the author’s ability to transform the ‘ordinary’ into the ‘terrifying.’ Granted, a good idea isn’t the only requirement here—execution plays a big factor. The novel has to be well-written, descriptive, and well thought out. And I’m happy to say that Joe Hill’s N0S4A2 meets all these requirements, and more. N0S4A2 is the complex story of Charlie Manx and Victoria “Vic” McQueen. At the start of the story, we see the former as a near-comatose serial killer, who was known to be most active in the 1980s to the early 1990s. Manx kidnapped and presumably killed children, abducting them using his untrackable 1938 Rolls Royce Wraith, which curiously enough, bore the vanity plate N0S4A2. According to Manx, he was bringing the kids to Christmasland, where pain could never touch them, where the pockmarked moon winked at passersby, where clouds weren’t really clouds but cotton candy. Vic, on the other hand, was Manx’s downfall—as Manx was hers. She’s not quite his final victim, but he does break something in her. When Vic traveled the Shorter Way Bridge as a teen, she discovered the truth about the ageless Manx and Christmasland. She found out that she and Manx shared a similar talent—the ability to tap into the mind’s inscape and use the alternate realities created by their distinct identities to further their means. For the young Victoria McQueen, traveling through the long-sunk covered bridge was a way to locate anything or anyone. In Manx’s case, it was the ability to use his Wraith to bring his kid of choice to Christmasland, where he sucked the youth and the good out the child. Their first encounter had Vic scarred for life, and Manx in what seemed like a permanent vegetative state. But as is the case with most horror stories, the monster doesn’t stay down for long. Manx recovers and exacts his revenge on Vic, by taking her son. Ultimately, N0S4A2 is the story of a mother’s unconditional and saving love—though it is, by no means, a sap account. 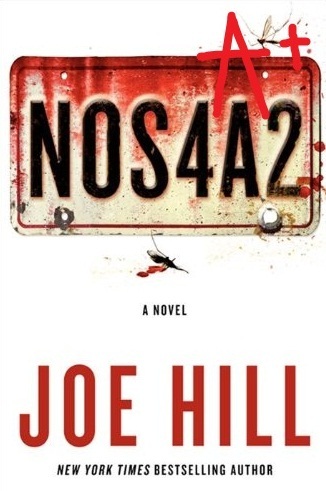 In N0S4A2, Joe Hill doesn’t skimp on the shock factor and the horror. By juxtaposing the ‘warm’ familiars, (things we associate with love like mothers, children, and Christmas), with the stuff of nightmares (mommy rapists, zombie children with rows and rows of needle-like teeth), Hill creates a fascinatingly frightening world that keeps you guessing on whether or not good will prevail. Now, I don’t scare easily—at least, not when it comes to horror stories. But N0S4A2 has all the essentials of a truly scary read. Though I highly recommend this to most everyone, this is not for the easily queasy or the faint-hearted. This review gave me the chills! A book definitely not for the faint of heart. Won’t read it though because stories about serial killers — people you could meet in real life — make me extra panicky. I can take and rationalize away the supernatural but never the killers. Too true. It’s the type of book that kinda stays with you. I’ve seen a lot of people (at airports and bookstores and libraries) reading this book, but I hadn’t had the chance to look into it. Now I might have to actually read it! If you like horror, then I think you definitely would. 🙂 Hill is immensely talented, and the story is very well crafted.